Venezuela's reputation as one of the most murderous nations on earth was further underscored on Tuesday when former boxing world champion Antonio Cermeno was found dead on a roadside. The body of Cermeno - nicknamed El Coloso (The Colossus) during his career - was discarded on the Caucagua-Higuerote highway in Miranda a day after he and his family had been kidnapped. His relatives had escaped when their abductors stopped at a garage to refuel the car. 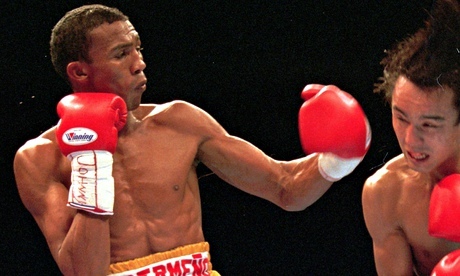 The 44-year-old was a popular figure in Venezuela and the boxing world. He held the WBA super bantamweight title from 1995 until 1997, and then won the featherweight title in 1998. After his retirement in 2006, he worked on social projects and helped to develop the Street Boxing program for disadvantaged youths. His killing is the latest high-profile blow to a nation that is struggling to grapple with an explosion of violent crime. Last month, a former Miss Venezuela and telenovela actress was found murdered in a car along with her British ex-husband Thomas Henry Berry. In the wake of that killing, President Nicolás Maduro promised to tackle crime, particularly abductions and homicides. According to a 2010 UN report, Venezuela is among the four most murderous nations on earth. However, unlike the others - Honduras, El Salvador and Jamaica - it suffers far less from poverty and inequality, which has raised the question why it is to vulnerable to violence. Concerns about crime are high among the priorities of the tens of thousands who have taken to the streets in recent week, resulting in more killings.